Can you run as fast as this man? Mo Farah can run really fast. And even though he makes it looks easy, it defintely isn't. In fact it can be downright dangerous. It kind of looks like fun to try this. Even though I don't think I would last much more than a few seconds! Normally I'm not a big fan of making comparisons. Because usually they leave you feeling bad about yourself. 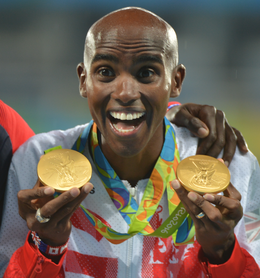 But by comparing yourself to Mo Farah you may feel inspired. Not to run as fast as he can, but to run. Great encouragement here. Comparisons help no one if they make us feel less than, but instead they should encourage us to strive to keep getting better at what we do!